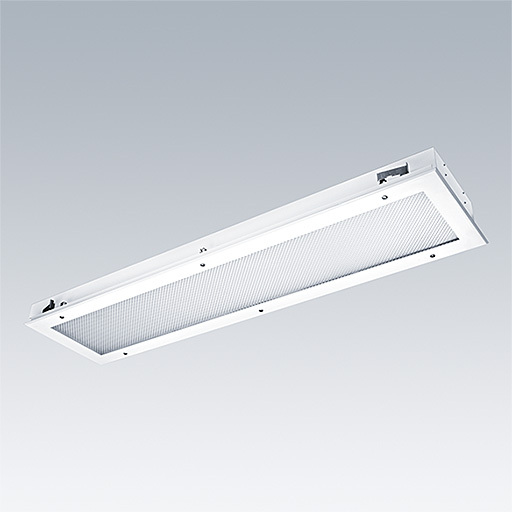 Recessed sealed luminaire IP65 for 2 x 58W T26 lamp, electronic - fixed output ballast. Body fabricated from mild steel with white powder coated finish. Frame fabricated from mild steel, with welded corners, finished white powder coated. Gasket: silicone. Diffuser panel clear prismatic PET/G, impact resistant and flame retardant (UK Building Regs Part B2 classification TP[a]). Complete with 840 lamp(s).